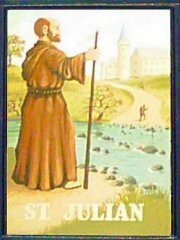 The St Julian Inn is a traditional pub with real Welsh Hospitality which sits alongside the river Usk and is named after Saint Julian the Hospitaller. Saint Julian is a popular saint in Western Europe and, according to the legend, was a nobleman who through a mistake of identity killed his own father and mother. As penance, he and his wife travelled to Rome as pilgrims seeking absolution. On his way home he went with his wife to live by a ford across a river where they gave help to travellers, building a refuge to care for the poor and sick and rowing travellers across the river for free. Very appropriately in our case, over the years he has been honoured as the Patron Saint of innkeepers, hospitallers, pilgrims, ferrymen, boatmen, fiddlers and wandering musicians - in fact an ideal choice after which to name our pub! So if you really want to enjoy our traditional Welsh Hospitality then please feel free to drop in at any time when we are open - you'll be made very welcome!